HONG KONG, 25 Jan 2010- Advanced Card Systems Ltd. (ACS, wholly owned subsidiary of Advanced Card Systems Holdings Ltd., SEHK: 8210), Asia Pacific's number one supplier of PC-linked smart card readers, today announces that its eH880 eHealth Smart Card Terminal has been awarded the "2009 Hong Kong Awards for Industries: Machinery and Machine Tools Design Certificate of Merit". The Hong Kong Awards for Industries (HKAI), championed by the Hong Kong Government, evaluates and rewards annually the outstanding achievements of Hong Kong enterprises in their technology advancement and value-added endeavors. ACS joined the competition for the Machinery and Machine Tools Design division, and was honored by the Certificate of Merit for its eH880 terminal which was designed for use in electronic health card systems. The eH880 was considered outstanding by the Judging Panel in all the above mentioned criteria. In addition, the Panel made a noteworthy mention of the eH880 being a secure smart card terminal dedicated to the eHealth market. The device is capable of facilitating secure mutual authentication, displaying detailed and multiple-layered information, and facilitates transactions through both private and public network infrastructures. Moreover, the product is ergonomically designed and capable of supporting additional features such as WiFi access and biometric fingerprint sensor. The HKAI Award Presentation Ceremony was held at the Hong Kong Convention and Exhibition Center on January 18, 2010. 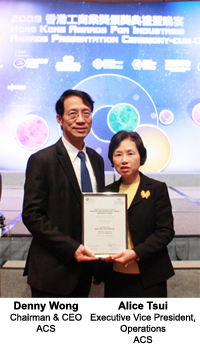 Mr. Denny Wong, Chairman & CEO of ACS (picture on the left) was present to receive the award on behalf of the company. "This distinguishing certificate recognizes our achievement in our endeavors to make eH880 an excellent and reliable eHealth smart card terminal. I am thankful to the Hong Kong Government for conferring such awards to encourage Hong Kong enterprises to strive for excellence in products and services. I also highly appreciate the efforts of our engineering team for designing such a marvelous device," expressed Denny. "This award marks a good beginning of ACS in 2010. I hope that with the eH880, ACS can make a contribution to the world in its increasing trend to digitize health information in order to provide better care to patients and at lower costs!" Advanced Card Systems Ltd. (ACS, wholly owned subsidiary of Advanced Card Systems Holdings Ltd., SEHK: 8210), founded in 1995, is Asia Pacific's number one supplier of PC-linked smart card readers and winner of Product Quality Leadership Award for Smart Card Readers from Frost & Sullivan. One of a select group of global companies at the forefront of the smart card revolution, ACS develops a wide range of high quality smart card reading/writing devices, smart cards and related products and distributes them to over 100 countries worldwide.Visit ACS at http://www.acs.com.hk/. The Hong Kong Awards for Industries (HKAI) was officially launched in 2005, upon the merging between the former Hong Kong Awards for Industry and the Hong Kong Awards for Services, established in 1989 and 1997, respectively, to rationalize and update the scope of the awards. Covering seven categories, the HKAI continues to recognize outstanding achievements of Hong Kong enterprises in their move towards higher technology and higher value-added activities. Learn more about HKAI at at http://www.hkindustryaward.org/.